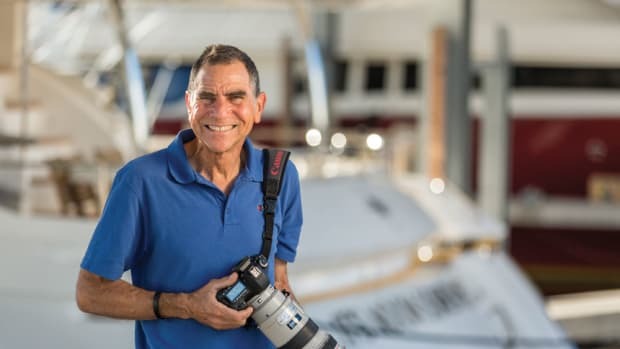 Michael Gorman grew up on Lake Ontario in Oswego, New York, and got his first taste of boating at a summer sailing camp that his parents had to persuade him to attend. 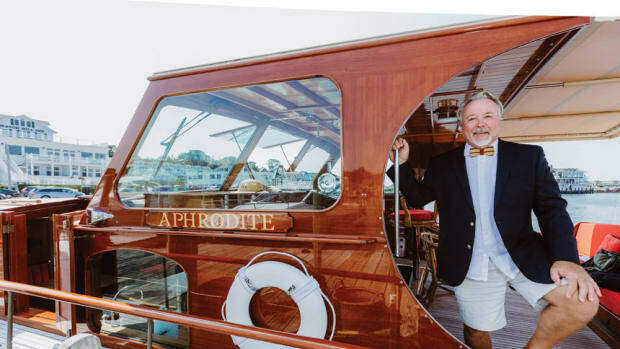 He eventually took to being on the water, scavenging sailboards from dumpsters and using them to explore, and later, discovering the joys of cruising small sailing craft long distances. 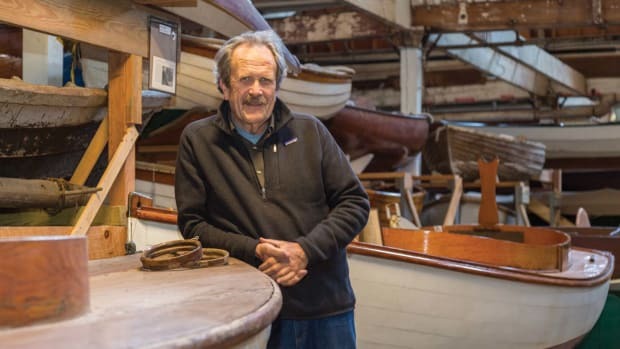 After attending a couple of art schools, Gorman wound up at The Landing School in Arundel, Maine, where he fell in love with wooden boatbuilding. 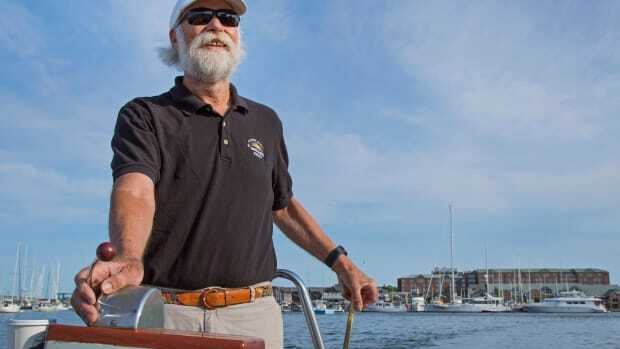 These days, he is the boatyard manager at Chesapeake Bay Maritime Museum in St. Michaels, Maryland. 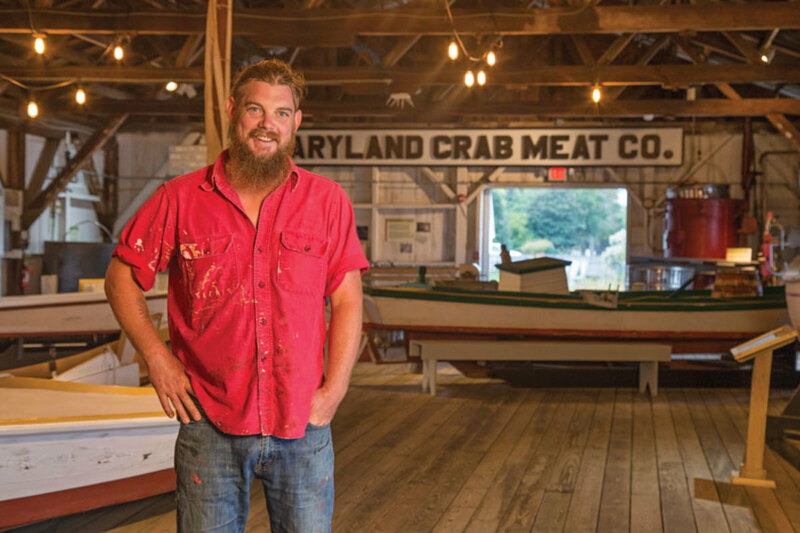 Gorman oversees the upkeep and maintenance of a fleet of 13 historic vessels, including a 1909 crab dredger, a 1934 Hooper Island draketail, a 1912 Delaware River tugboat and a 1920 buyboat, among other traditional Chesapeake Bay vessels. Gorman is managing the $1.2 million restoration of the museum’s 1889 log-bottom bugeye Edna E. Lockwood. He recently orchestrated cutting Edna free from her old bottom. She is expected to launch — with a new bottom — in October 2018. Gorman lives in St. Michaels with his wife, Courtney, and has two daughters — Hazel and Waylon. When he’s not restoring or maintaining wooden boats at the museum, he enjoys racing log canoes on the Miles River. First memory of being on a boat: My parents forced me to go to sailing camp in Oswego, New York, on Lake Ontario, where I grew up. The sailing program was probably fantastic, but the idea of spending my summer days on a Sunfish, instead of playing in the woods and building forts, wasn’t appealing to me. First boat you owned: Probably one of the windsurfers my father, brother and I dragged out of a dumpster at a well-to-do kids’ camp on Raquette Lake in New York. We had those boards for years, and they taught me great lessons on the virtues of having a small boat for exploring and enjoying being close to the water. Last or current boat: Currently driving Bufflehead, the newest and best log canoe in the Miles River fleet. We built her at the museum. Though our boat is the smallest — 20-foot waterline and 33½ feet overall — and more often than not the last boat to finish, I am convinced we have more fun out there than anyone else. Favorite boat: The one I retire on — in clear, warm water — with my wife. 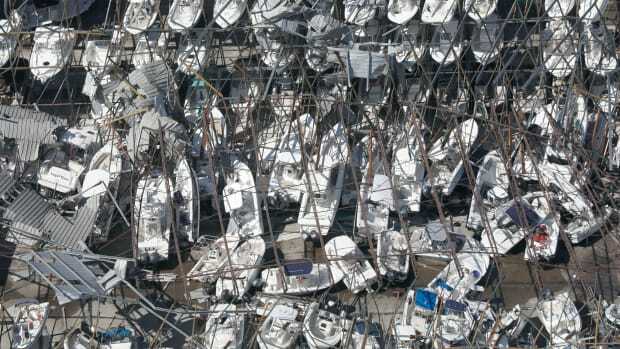 Your dream boat: No specific boat, but I have a laundry list of attributes I’d like it to have. Ideally, she would have a shallow draft, an oceangoing wooden hull, a pilothouse, a schooner or yawl rig, a cute little wood stove, simple systems and room for friends to visit. A sweet-looking sheer line wouldn’t hurt, either. Most rewarding sailing experience: Six months from Lake Ontario to the Abacos with my father on his Fuji 35. 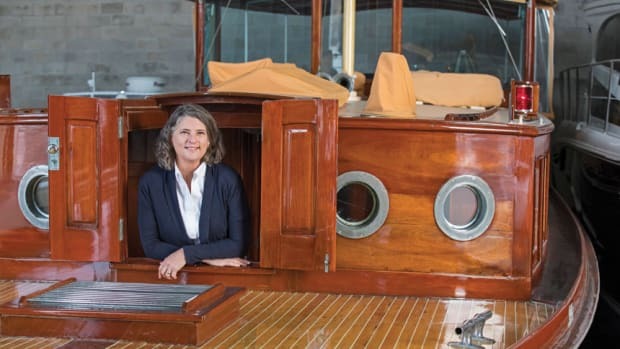 He bought the boat out of the Arizona desert and completely restored her. It was his dream to cruise the boat and winter in the Bahamas. He and I fought, the engine would break down in 40 knots of breeze, and we drank way too much warm rum. We also lost our quarantine flag and had to hoist my father’s yellow swimsuit instead. Too many stories. I am just happy I got to tag along. Scariest adventure aboard: A three-month trip with three guys on a San Juan 23 from Oswego to St. Michaels with just a bucket for a head. Avoiding all the powerboats in New Jersey was, well, interesting. Most memorable experience aboard: Thanksgiving Day a few years ago, when we were the only boat on the Miles River off St. Michaels. We took out a wooden Thunderbird I owned at the time. With friends and family on board and some great drinks, it was the best time I’ve ever spent waiting for the turkey to cook. Longest you’ve been at sea without setting foot on land: Ten days by myself in the Upper Chesapeake Bay, exploring, swimming, cooking meals, reading books and drinking warm beer. Favorite destination so far: The Erie Canal — it is an amazing waterway. I learned so much, and negotiating the locks was a blast. I think most people look at the canal simply as a necessary evil to get where they are going, not a destination. I cannot wait to take my family there for a summer to just explore and cruise from Buffalo, New York, all the way down to the Hudson River and New York City. Also, the Bahamas are a great place to spend a winter. 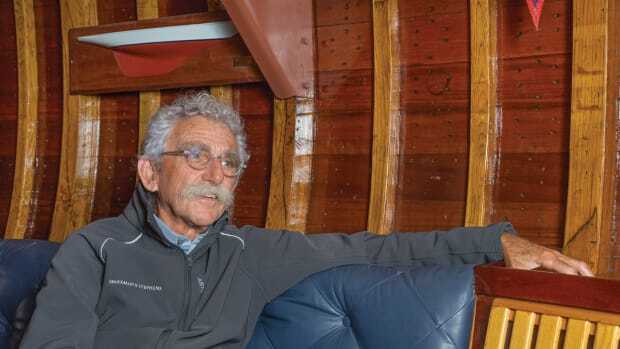 Favorite nautical book: How to Build a Wooden Boat, by David “Bud” McIntosh. 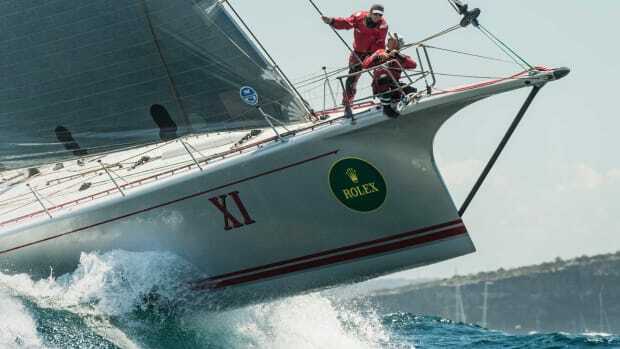 Favorite quote about the sea: A sign I saw hanging in a boatbuilder’s shop: “Men’s lives are in your hands.” I hadn’t thought of it that way before.